Do Retailers have the processes in place to support and deliver their checkout service promise? In the first article, we talked about the overwhelming evidence that a better and faster checkout experience contributes heavily to shopper’s overall satisfaction with a retailer and that by creating this experience, a retailer can differentiate themselves from their competitors. In the second article we discussed the need to first understand your current service level and the effort required to achieve your desired service level before making a service promise. This article – the third in the series - focuses on implementing your strategy and the process changes required to ensure it is maintained and consistently delivered. A check-out service strategy can only work if associates are aware of it. Communicating the strategy to associates takes planning and on-going training. Continuous reinforcement is required in order for it to stick. Retailers known for great service generally have spent many years building a ‘culture of service’. Associates are indoctrinated into this culture from day one of their employment, and it is incorporated into all aspects of their training and daily communication with management. Once the check-out strategy is determined, a communication plan is needed that clearly states the strategy and clarifies how each associates’ role contributes to executing that strategy. It is also important to regularly communicate to all associates how they are performing against the service objective. 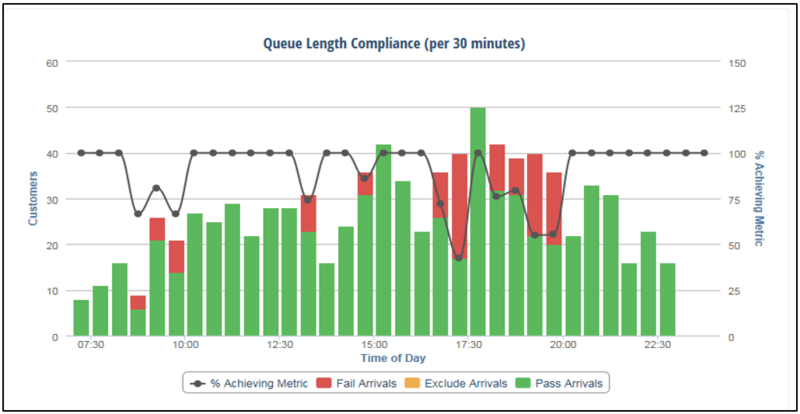 The Irisys Queue Intelligence™ management system provides continuous, 24-hour measurement of queue lengths, wait times, cashier utilization, under and over staffing and other key metrics. The system has a real-time dashboard that shows the status of the front end. It provides end-of-day reporting that shows service levels by time of day, which can be used to identify trends, adjust labor schedules and train Front End associates. There is also a Till Profile that can be fed to the Retailers workforce management system. The profile provides a forecast of the number of registers needed by time of day to meet the service objective. As we worked with retailers around the world, we identified several key practices that support delivery of the service promise without using excessive labor. They are listed here; we’ll elaborate on them in a future article. Make providing good customer service on the Front End the responsibility of the entire store. Make sure labor contracts are flexible enough to permit various job roles to fill the Cashier role as needed. Ensure that policies and practices don’t allow or encourage sick call abuse and are designed to minimize the impact of unplanned absences on customer service. Keeping your service promise takes communication, on-going measurement and correction, supporting processes and continuous reinforcement. The benefits, however, are tremendous and have been proven by the success of retailers known for reliably delivering great customer service.